Our farming model gives prominence to small scale operations that are integrated! We are firm to replicate the quality and not scale-up the quantity by compromising quality. Growing crops or producing milk on mass scale is the culture of western countries. In India, the traditional agriculture system focuses on inter-dependence between various verticals of farming in small scale set-up. Farmers grow grains, pulses and vegetables, post harvesting the crop-residue is fed to the cattle and the farm produce plus cow milk are sold to same end-users. It is a sustainable cycle. We have grouped like-minded farmers in the district and sell their produce collectively to the town/city based direct users residing within 100 km vicinity through a common distribution and delivery system. We also maintain the best quality as there is strictly no use of chemicals throughout the process. This model is successfully working in Chandrapur town, Maharashtra since 2014. Presently there are 300+ customers and 25+ farmers in the network. Farmers are residing 10-15 km far from the town. 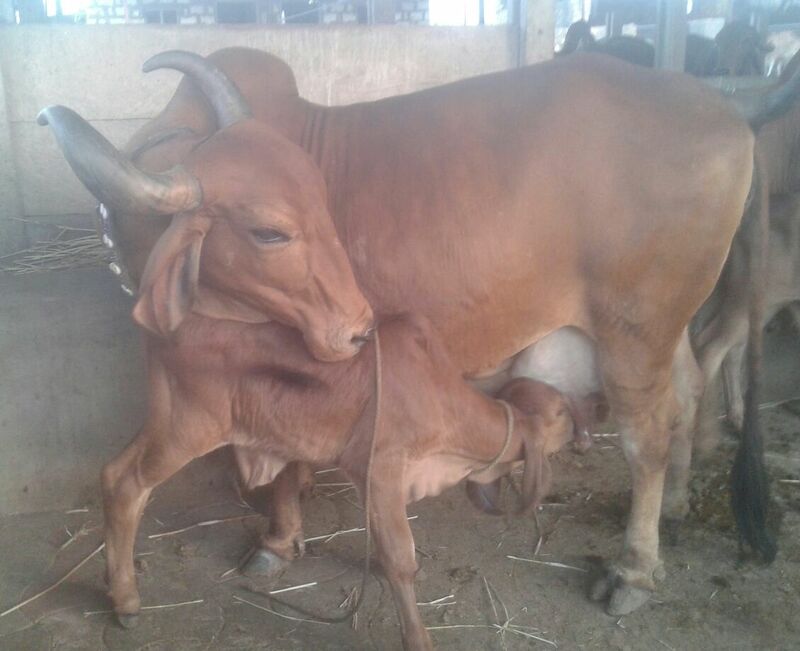 In our farmers’ network we are rearing three milking cow breeds namely gir (origin- Gujarat), gaulau (origin – Vidarbha) and lal kandhari (origin – Nanded district, Marathawada region, Maharashtra). Everyday 130+ liter milk is supplied at the customers’ door step. Our farming model is smoothly operating now after the struggle and sincere efforts of more than three years. Initially when we started the scenario was quite depressing as farmers were taking extreme step of ending their lives due to huge debt and no ray of hope. To put an end to suicides, the reason behind loss in farming and mounting debts was to be identified. To do so I compared the farming practices of western Maharashtra as in Konkan region (farmers were able to earn better) and eastern Maharashtra in Vidarbha region (farmers were in debt and committing suicides). I found the difference in rearing livestock and farm integration. Farmers in Konkan belt rear cows and grow multiple crops. They have more than one source of income from farming! However I also could understand the practical problems in replicating the same farming model of west in the east because in our Vidarbha region where cotton and soyabean is the main crop grown there is no crop-residue left to feed the dairy cattle. Further farmers’ land holding was less making it difficult to grow fodder crops exclusively for cattle. Therefore fodder was the main hurdle in rearing the dairy cattle! It was mandatory to rear cows and fodder was an issue! 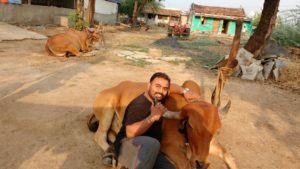 To solve the complexity of the situation we did intense research and found rearing desi breed cows in the farm was best in the favour of the farmer. Low fodder intake, flexible to all sorts of farm residue as feed, less maintenance cost and adaptable to the climatic conditions of Vidarbha region. 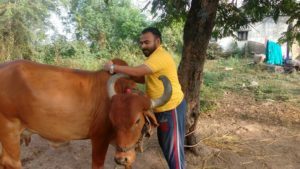 In addition bulls of desi dairy breeds can only be used in farming activities because it has a hump unlike buffaloes and hybrid breeds animals. Indeed lack of fodder was the biggest hurdle farmer face for rearing dairy cows and bulls. To resolve the problem, we collectively procure dry fodder of food grains from nearby states, we encourage farmers to grow sorghum because these days in our state sorghum is sold at higher price than wheat and rice plus its’ residue is excellent fodder for cows and we feed the cows with rice-barn cake obtained after processing paddy. Even the cows are left for grazing in cotton fields after harvesting cotton. We could convince farmers to grow seasonal vegetables in different batches across their farmland like okra and guargum etc after harvesting paddy/sorghum. The vegetables harvested are sold to the consumers while in the same batch-field cows are left for grazing. Left over plant residue after grazing is mulched back in the soil. In this way batch after batch the revenues are generated and green fodder is available for few days for the cows. We pay Rs. 35 per liter for A2 milk to the farmers. It is Rs. 15/liter more than what they used to get when the milk was sold at dairy co-operative. It motivated the farmers to make the switch to desi breed cows more sincerely. Similarly they are paid premium price for paddy, pulses and vegetables grown without using any chemicals in their farm. Milk is collected at the collection center at 6.30 am. It is taken to the packaging unit at Chandrapur in normal milk can where the raw milk is packed in ½ kg packs. It is then delivered at the customers’ door steps between 8-10 am. Similar process is repeated in evening that begins at 6.30 pm. There is no pasteurizing or chilling done yet milk stays fresh because it is pure A2 milk! In winters the milk production increases so we process the excess milk into panner or khova and sell it to the same consumer network. Similarly vegetables, pulses and food grains are also sold. The profits earned are re-invested in training farmers on improving the farm production and dairy management. In future we want to replicate the same model in other districts too in eastern Maharashtra but with new network of farmers and customers. Every farmer must be benefitted with this model then only entire community would flourish. We are also constantly creating awareness on A2 milk and organic food. Our country will prosper only when our countrymen are healthy. And to improve the health only way is to go back to the roots and adopt chemical free food. Time has come that every Indian has family farmer instead of family doctor. Make this change as soon as possible and live happily ever after! Mr. Raut completed his engineering degree (computers) at YCCE, Nagpur in 2011. Inspite of having a good job in hand in IT sector through campus recruitment he left it for doing something meaningful for the farming community. To refine his idea into a tangible process he joined the Social Entrepreneurship programme at Tata Institute for Social Sciences (TISS), Mumbai in 2011. After completing his education he returned back to his hometown and started working for the farmers’ welfare.